My father Robert Lincoln Hershey (Bob), and his brothers Ken and Alan would be 5th cousins and my sisters and cousins would be 6th cousins, and my kids are then 7th cousins! 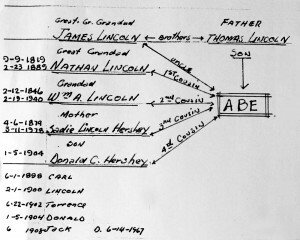 You are correct on the name Lincoln…..my grandpa’s brother. I also have a first cousin named Tad (Ken Hershey’s oldest son was named after one of Abe’s sons). So there you have it!!! 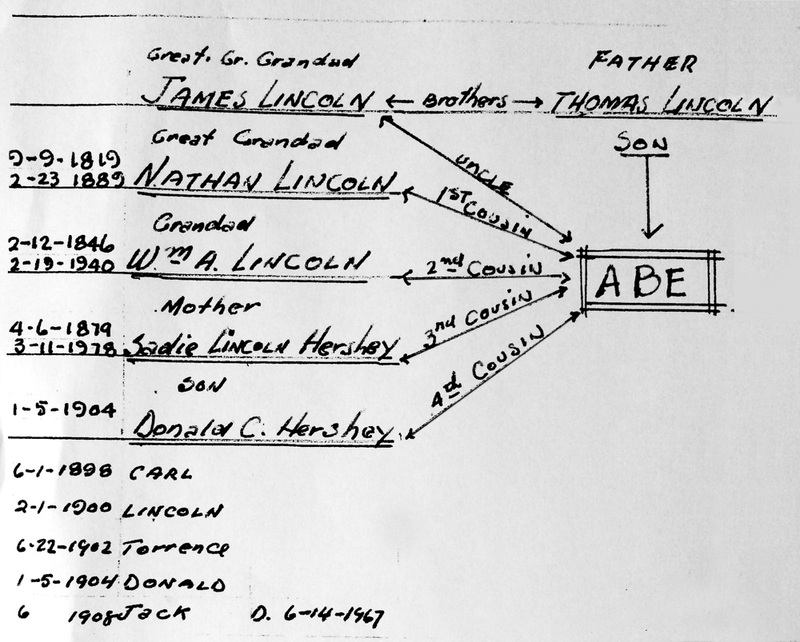 So you see….my grandpa’s Great Great Granddad was James who was Abe’s uncle. He had a son named Nathan who had a son named William who was my grandpa’s Grandad. His daughter was Sadie who married a Hershey and had my grandpa along with the other 4 boys.